Synopsis: LITERARY QUOTATIONS: GENRE is an informative and entertaining collection of quotes by writers, editors, critics, journalists, and literary agents on the subject of literary genre. The quotes also touch on the subjects of craft, creativity, publishing, and the writing life. 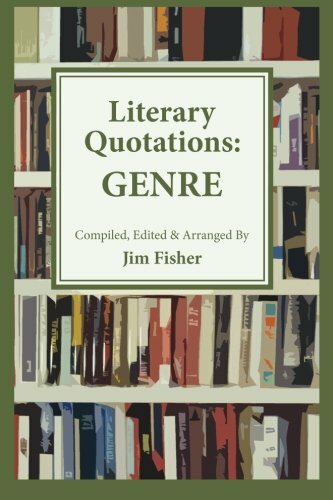 LITERARY QUOTATIONS: GENRE was compiled, edited, and arranged by Jim Fisher, writer, professor emeritus at Edinboro University of Pennsylvania, and former FBI agent. Fisher is the author of nine nonfiction books, including TEN PERCENT OF NOTHING (Southern Illinois University Press), an expose of a bogus literary agent, and THE WRITER'S QUOTE BOOK: 500 AUTHORS ON CREATIVITY, CRAFT, AND THE WRITER'S LIFE (Rutgers University Press). He is also the author of the Literary Quotations Collected Blog (literaryquotationscollected.blogspot.com) and the popular Jim Fisher True Crime Blog (jimfishertruecrime.blogspot.com). About the Author&colon; JIM FISHER is professor emeritus at Edinboro University of Pennsylvania and a former FBI agent. A graduate of Westminster College and Vanderbilt University Law School, Fisher is the author of nine nonfiction books, including TEN PERCENT OF NOTHING (Southern Illinois University Press), an expose of a bogus literary agent, and THE WRITER'S QUOTE BOOK: 500 AUTHORS ON CREATIVITY, CRAFT, AND THE WRITER'S LIFE (Rutgers University Press). He is also the author of the Literary Quotations Collected Blog (literaryquotationscollected.blogspot.com) and the popular Jim Fisher True Crime Blog (jimfishertruecrime.blogspot.com).